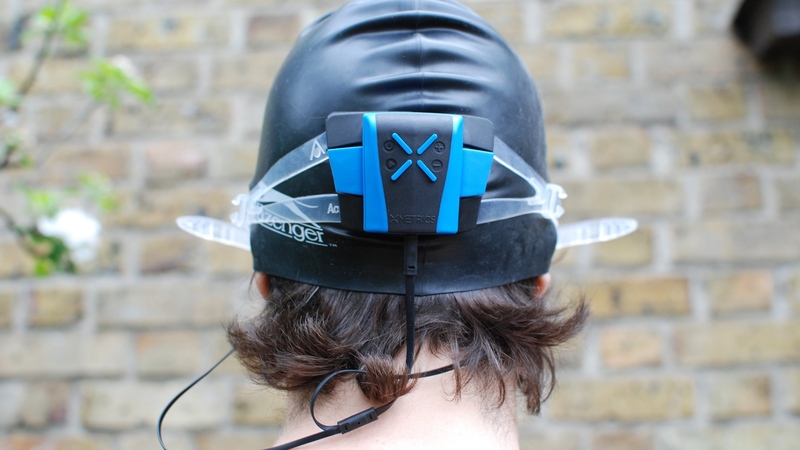 The XMetrics Pro aims to fix the biggest problem faced by the Garmin Swim – our previous favourite swimming wearable: that it's not actually very easy to look at while you're in the pool. And it's a problem for a bunch of excellent swimming devices such as the Moov Now, Garmin Vivosmart HR or Polar A360. The problem with swimming, of course, is that your arms are windmilling all over the place. The moment you break stroke to check on your progress, not only are you no longer propelling yourself towards your goal, you also begin slowing yourself down (sinking) thanks to the drag from that out of place limb. A swimming-focused Italian start-up called XMetrics decided that enough was enough: one successful crowdfunding campaign later and it's produced a device that tells you all about your progress without you having to look at it once, because this swim tracker talks to you. We took the plunge with the competition-grade XMetrics Pro. There's something very clever but also very flawed about the way the XMetrics devices are designed. The theory is that it sits on the back of your head, out of the way and minimising drag. You feed your goggle straps between the black rubber and plastic casing and it should snap on nice and snug. Except that it doesn't. Our goggles were a little too fat to allow the mechanism to clip back into place. In fact we actually broke the mechanism when trying to make it work. As it happened, a second member of the Wareable team was also testing out the XMetrics Pro. Quite independently, he broke his in the same way. Could we both be clumsy idiots? Yes, we could, but the world is full of idiots and they need swim trackers too. So while the design is a clever one on paper, the actual physical version of the XMetrics needs to offer a little more latitude and be a whole lot more robust. Should you manage to get the tracker successfully onto your goggles without rendering your $318.15 purchase totally useless, firstly well done and secondly, you'll be pleased to note that it's not an operation you'll have to perform again. The main computational part of the XMetrics Pro detaches from the goggles clip section with a neat little twist. That means that you can plug it into your computer and charge it up without having to get your eyewear all tangled up with your laptop charger cable and everything else. It also means you can get it off your head in the pool if you think there's a problem. It's probably the best bit of design about the whole thing. With any luck, the rest of the product will catch up when the next model comes out. So close and yet so far. Let's get the easy positive stuff out of the way first. It's simple enough to use. There are four buttons on the device which you can reach around and use blind while it's on the back of your head, so long as you can remember which one is which. They're easy enough to find with your fingers and you'll get feedback bleeps in your ears to let you know you've successfully pressed them. Essentially, there's on/off, stop/go and a volume control. There are some long press options too, but sadly the most important of those failed to work on our model. More on that in a moment. XMetrics, as one would hope given the price point, measures everything you'd find on any other swim tracker and a little more besides. It counts lengths, pace (your time over 100m), the number of strokes you take each lap, your stroke rate, your distance per stroke and SWOLF (stroke efficiency). It's also supposed to keep track of breath counts but that never showed up on the readings in the web app. Again, more later. We tested for accuracy against a Garmin Swim and most of the time the comparison was favourable. The two didn't always agree but they were consistent with respect to their own readings which is what counts. Now, we say that the comparison was favourable "most of the time" because one of the main problems about this brand new piece of kit is that it has a tendency to trip out every now and then. On one test occasion it crashed after a few lengths and wouldn't turn back on. On another, it missed a lot of lengths despite the nice, positive, kick turns these things generally need to register a new lap. The upshot is that it's just not quite trustworthy enough at present, which is a pity because the potential is there to see. When it came to the audio feedback, we were also pleased with how easy it was to hear and understand the stats, and how effective the virtual coaching mode is, but there are still serious problems with it for the time being. You get four choices of information into your ears – your time, your laps, your time and laps, or your stroke frequency – but you can only choose one setting. Now, the only true live coaching mode of those is stroke frequency, which lets you know whether to speed up or slow down your arm cycles over the first 10m of each lap. You get metronomic beeps which are very effective at dictating your rhythm, but while it's really good at pacing you out to better achieve your goals, it's rather annoying that you can't get any idea of how far you've gone or how long you've taken during the same session. There should be a way of switching between modes while you're in the water but it's not something you can do very easily and, more to the point, it's a function that doesn't seem to be enabled yet – at least not in our model. Before we even get to the app, it's worth mentioning that the connection cable that comes with the XMetrics isn't great. It's a USB at the computer end and a 3.5mm jack at the other – not a bad idea given that it uses the same socket as the headphones. After all, nobody wants to pay for the hassle of having to fully waterproof a second port. The trouble, of course, is that you can't connect the XMetrics to your computer while it's still wet and it takes at least 40 mins for it to dry out properly. That was our record and involved standing around in the changing room trying to physically shake the water out as well as turning the hairdryer on it at full blast. The obvious way around this would be a wireless hook up. There's already Bluetooth embedded but you can't use it to transfer swim data. Not yet anyway. The Bluetooth is there so that you can link the device to the mobile phone app, but the all that's good for – when it decides it's going to work – is changing which kind of audio feedback you'd like to receive. There's no pocket-sized activity log. That's all saved for the desktop-come-cloud application which is where you'll find all the analysis. The desktop end allows you to choose your audio feedback settings and upload your swim data to the internet. If you want to look at your metrics, you need to click on the section that takes you to the web-based XMetrics Link app. It's a shame that you need an internet connection to look at your performance, but it's no different to many other platforms such as those from TomTom and Garmin. What's harder to swallow is that the graphical analysis of one's performance and technique is rather disappointing for a pro-level device. There are a couple of stats missing which we know the XMetrics can record. The first of these is turn times and the second is breath counts. It promises to include these but there's nothing forthcoming in the current version of the web app. The next thing we'd like to see is more in the way of graphs. At the moment, there's a table of columns and a few bar charts documenting pace, strokes and SWOLF for each lap. It's not bad but it's no better than any other swim tracker. Lastly, there's no coaching advice or swim plans for how to improve your technique and fitness. Ultimately, all of these gripes can be addressed with the current model. It's just going to take a lot of firmware and web app updates. At the time of writing, there have been none. The XMetrics Pro costs a lot given that you're not getting much more functionality than with many of the other swim trackers out there – which come in at a fraction of the price. Fortunately, you don't have to shell out on the$318.15 Pro model if you'd rather not, as the plain old XMetrics Fit is just $216.91. This model still gives you audio feedback but only tells you how many lengths you've done, without the option of stroke rates and times. For most swimmers these probably aren't essential features, so the Fit model represents quite decent value. The other feature you don't get is the ability to share the recorded data with your swimming coach but this isn't available on the Pro version yet anyway. Both models require charging up by USB, and you can get at least three swims out of a single charge as long as you're careful to turn it off in between sessions. Ask to see a great wearable that isn't quite ready yet and we'll show you the XMetrics Pro. It's going to be a great bit of kit but for now, it runs properly about as often as it doesn't. All the hard work on the equipment has been done but the company needs to spend another few months building the consumer delivery before it's really a device worth buying. It's buggy, it's fragile, the virtual coaching options need to be improved and the data analysis is lagging behind the potential of what the device itself can capture. We love that it's not on your wrist and we like that it talks to you, but so far those pros are outweighed by the numerous cons. So don't buy it today, but keep your eyes on it for the future.